THERE WERE OVER 2,700 homeless children staying in emergency accommodation on a single week last month, a new record high. Latest figures from the Housing Department show that there were 1,302 families with 2,708 homeless children staying in emergency accommodation in Ireland. As well as this, there were 4,972 adults, giving a combined number of 7,680 people. This surpasses all previous months, setting a record high for number of homeless people in Ireland over the past number of decades. There were 7,552 homeless people last month (a rise of 128). The number of homeless people has more than doubled since December 2014, when there were 3,738 homeless staying in emergency accommodation. Dublin has by far the largest number of homeless adults and children. There were 3,337 homeless adults in Dublin last month, as well as 2,262 children. Housing Department figures only measure the number of homeless people staying in State-funded emergency accommodation (like hostels, hotels, etc) and so does not count rough sleepers, people sleeping on couches, staying with family, etc. So the number of actual homeless people is certainly higher. The figures come following a tumultuous week for homeless services in Dublin. It was reported yesterday that 12 families with over 30 children were told to present to Garda stations for shelter as there was no accommodation available for them. One of the families slept in the offices of homeless community organisation Inner City Helping Homeless. Commenting on the figures, director of ICHH Anthony Flynn said that no proper planning was in place to help people in need. “Yet again we are seeing no improvement in the homeless crisis in Ireland as proper planning is not in place to assist these people in the short-term,” said Flynn. Sinn Féin housing spokesperson Eoin Ó Broin said Government policy was failing homeless people in need. “The Minister for Housing must do more to keep families in their homes,” said Ó Broin. He must also secure emergency funding to put a roof over the heads of families that have been in emergency accommodation or more than six months. 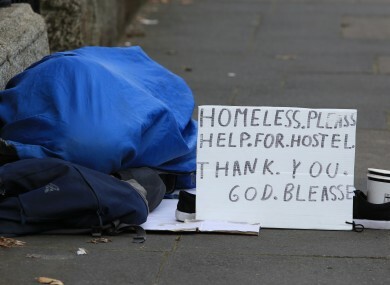 A spokesperson for homeless charity Focus Ireland said that the figures were “highly disappointing”. “These numbers must be seen as a line in the sand by the whole of government,” said a spokesperson. They must see this cannot continue. Email “Record high: There are over 2,700 children and almost 5,000 adults homeless in Ireland”. Feedback on “Record high: There are over 2,700 children and almost 5,000 adults homeless in Ireland”.